[UPDATE] Since the time that this was first published Frontier Developments has extended the “season” for the Horizons expansion into 2017, so the title is not very accurate anymore. However, when combined with our Mini Review of The Guardians you should have a good idea on what the state of the game is so far. With the Horizons expansion now available on both Xbox One and PC it seems a good time to run quickly through what has been accomplished so far within Elite Dangerous and cover some of the new features. 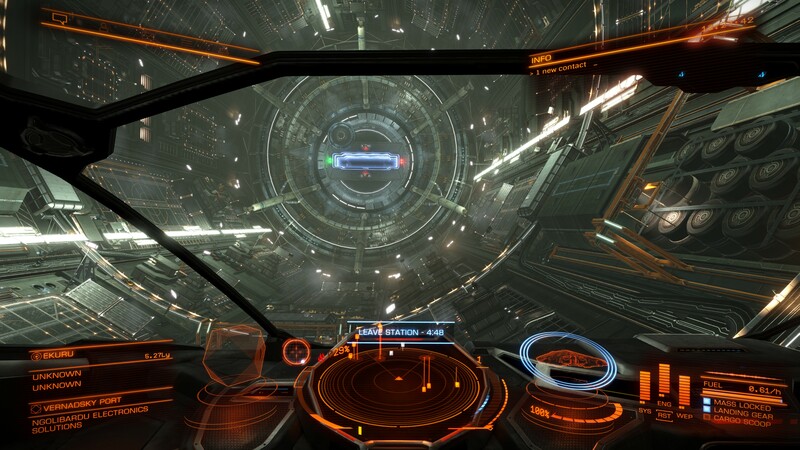 The new Mission Board that replaced the previous Bulletin Board at stations was introduced to all players, both vanilla Elite Dangerous and Horizons, as part of an extensive rework of how missions were being handled in the game. What’s immediately noticeable is that every mission is now grouped by faction: if part of your plan is to gain influence with the intent of greater rewards this simplifies the process as you don’t need to hunt through all of the missions to find what you want. The character portraits and flavour text are nice additions too as they provide a more personal touch to these transactions that takes a small step towards filling in what can at times feel like an empty universe. Having the community goals as its own item in the Mission Board is a really smart move. Previously I hadn’t become too involved in those events but having most of the information immediately there to see provides plenty of incentive to get involved. The rewards are great too and can provide a welcome boost to your bank account. If I were to nitpick, I wish that there was a navigation shortcut for community goals so that I could quickly plot a course, like you can do for other missions. Anything that can let you avoid entering text manually on the Xbox One is a good thing. Adding personality to the galaxy also comes through when you are entering and leaving stations. 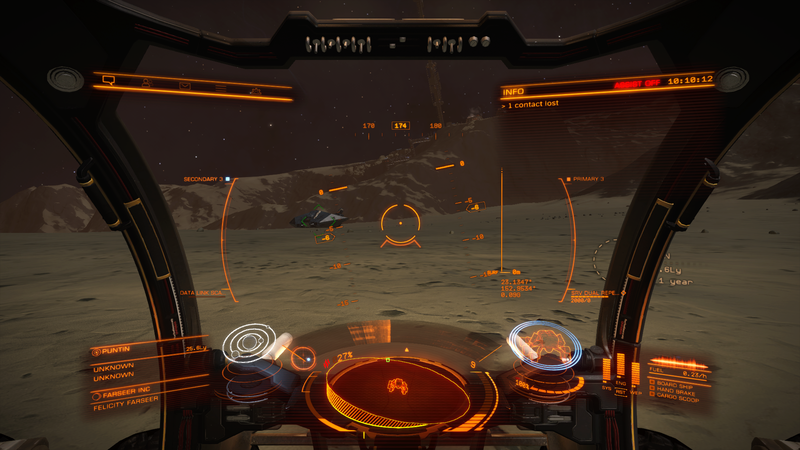 New audio has been added to both versions that replaces some of the old computer voice responses with comms chatter from the stations themselves. I’ve noticed at least a couple of different accents which is smart thinking – it’s a small thing but entirely appropriate. 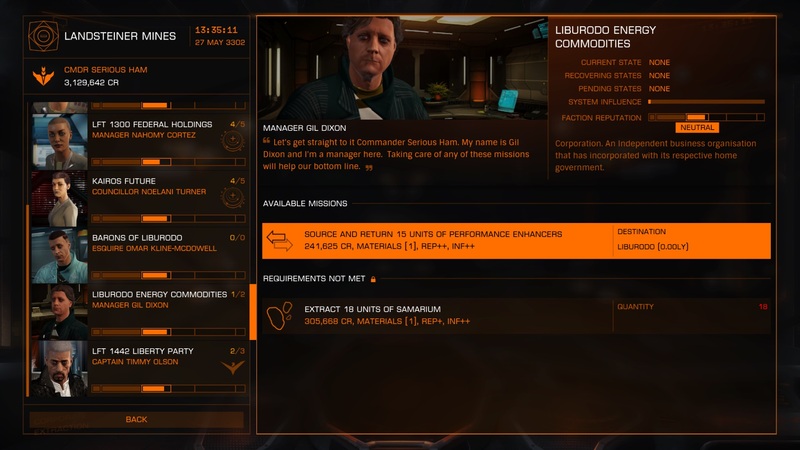 The outfitting screens have also been improved using a style similar to the Mission Boards. Instead of dealing with an endless list of components, all ship parts are now categorized which makes it easier to not only find what you are looking for but also determine if it will even fit in your vessel at all. When comparing new parts to old, the new interface helps to make it very clear what benefits (or not) you will have if you purchase a part. Previously ship upgrades could trip up players early on but the new screens should help a little towards avoiding bad decisions. For Horizons owners there is also the addition of planetary landings in your ships – not only are there stations located on the surface of many worlds but also new opportunities for mining and exploration via a Surface Recon Vehicle (SRV). You do need to sacrifice some storage space on your ship to house a vehicle hanger (and purchase the SRV too) but if you have the room it offers a new option that literally gives you worlds to explore. Right now you’re limited to landing on barren worlds, so no running over local fauna here, but there is scope for expansion in the future though no firm date has been announced for this yet. The game even lets you build dual vehicle hangers for your ship, which is good indicator of what else you will be able to do in future updates. The most recent additions to Horizons are The Engineers – a number of unique characters scattered across the galaxy who provide custom ship upgrades for those they are willing to communicate and deal with. Finding an Engineer is one thing but being allowed to trade with them is another. 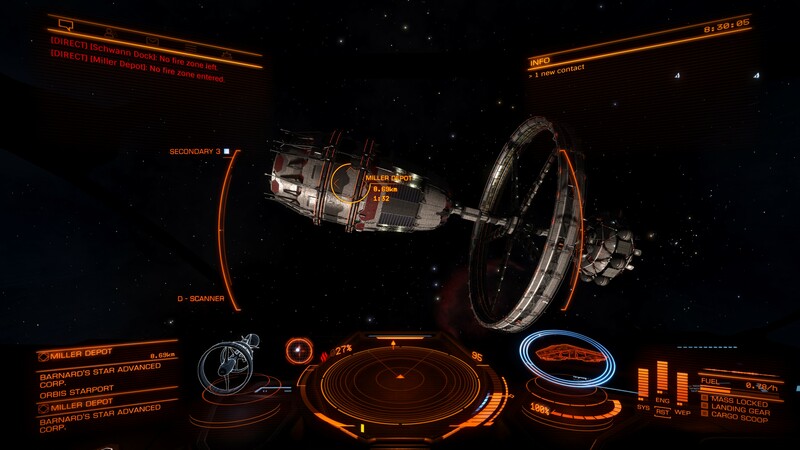 As I have played more on the Xbox One than PC it seems I had accrued enough of a reputation in vanilla Elite Dangerous to be contacted by three of them, each inviting me to visit their stations. On the PC it looks like I will have to work a little harder to get contacted by even one. Once you arrive at a station, your initial task will end up being to meet that particular Engineer’s requirements before they will deal with you. The tasks could be as simple as paying them a lot of money or could involve trading goods; in one case for me it was bounty vouchers. Once past that you’ll then have the option to upgrade some parts of your ship but may need to source additional components before it will happen. As you probably guessed, this has the potential to turn into a galactic scavenger hunt as you chase the things you need to score that exclusive upgrade but those will to commit the time and resources will get the rewards. The game will even let you tag what you need to collect for a single upgrade so you can keep track of your progress. For long term players, the prospect of scoring some epic loot for their ship finally gives them a chance to have a ship that is uniquely their own and perhaps have them pursue different avenues from normal in their quest to meet the next set of requirements. So… PC or Xbox One? It hasn’t been all smooth sailing for the updates with some early teething issues but the developers have been active in resolving them and with both console and PC finally at feature parity we will hopefully see advances come thick and fast for everyone. If you’ve got a PC with plenty of grunt, it’s hard to ignore that version with its support for high resolutions, VR headsets and a myriad on controllers. The game runs a lot smoother and bringing up menus and maps can be much faster that on console. However if you don’t have the PC for the task, the Xbox One version still has everything and looks great on an HDTV. There’s the occasional slowdown during frameshift jumps and map loading but it’s still the same game and you can quickly hook up with friends via Xbox Live too. 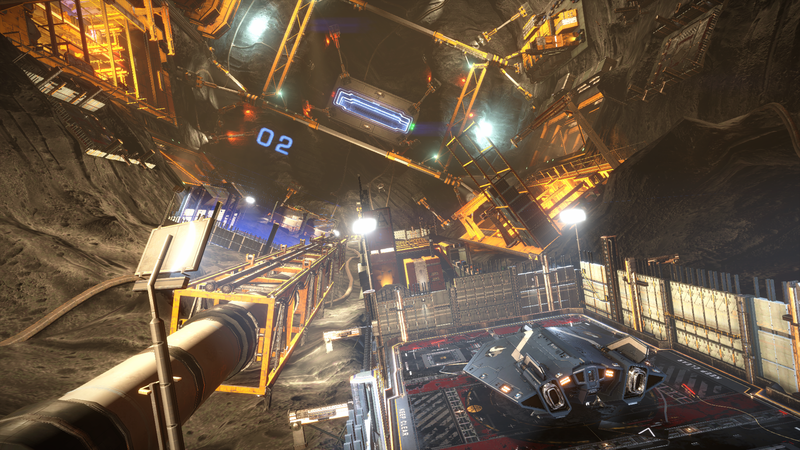 Eighteen months in and Elite Dangerous is showing potential in becoming a much more accessible game thanks to the reworking of the mission and outfitting menus. It can still be intimidating but the developers have taken a great step forward in helping first time players understand what they are getting themselves into. For long time players, the additions to both the vanilla experience and the Horizons expansion will not only give them more incentive to explore further and may even tempt them to try something different in a bid to get those nice big rewards. I have Elite Dangerous on both XB1 and PC. I have Horizons on XB1. Even though the PC version is a far smoother experience I still can’t go past the pick up and play XB1 version. I hate having to navigate via a Frontier menu first on PC before loading straight into the game. Just a personal preference in the end. I guess another deciding factor is whether you are sitting at a desk or not. I have no issues with the PC version when playing from my desk, just not really suited to lounge room gaming. Duuno, but for me this is a game for a HOTAS stick, and a solid desktop, with high res monitors and visuals cranked up to maximum. But even on lower settings and with a great Xbox controller profile, the low spec PC version is still really impressive and totally comparable to the Xbox One version. Which is great because then no one misses out on a great game.